A new paper by Anita Slonimska and myself attempts to link global tendencies in the lexicon to constraints from turn taking in conversation. In her Master’s thesis, Anita suggested that these similarities help conversation flow smoothly. Turn taking in conversation is surprisingly swift, with the usual gap between turns being only 200ms. This is even more surprising when one considers that the amount of time it takes to retrieve, plan and begin pronouncing one word is 600ms. Therefore, speakers must begin planning what they will say before current speaker has finished speaking (as demonstrated by many recent studies, e.g. Barthel et al., 2017). Starting your turn late can be interpreted as uncooperative, or lead to missing out on a chance to speak. Perhaps the harshest environment for turn-taking is answering a content question. Responders must understand the question, retrieve the answer, plan their utterance and begin speaking. It makes sense to expect that cues would evolve to help responders recognise that a question is coming. Indeed there are many paralinguistic cues, such as rising intonation (even at the beginning of sentences) and eye gaze. Another obvious cue is question words, especially when they appear at the beginning of question sentences. Slonimska hypothesised that wh-words sound similar in order to provide an extra cue that a question is about to be asked, so that the speaker can begin preparing their turn early. Of course, there are several possible confounds, such as languages being historically related, and many wh-words being derived from other wh-words within a language. We attempted to control for this using stratified permutation, excluding analysable forms, and comparing wh words to many other sets of words such as pronouns which are subject to the same processes. Not all languages have similar-sounding wh-words, but across the whole database the tendancy was robust. Another prediction is that the wh-word cues should be more useful if they appear at the beginning of question sentences. We tested this using typological data on whether wh-words appear in initial position. While the trend was in the right direction, the result was not significant when controlling for historical and areal relationships. Despite this, we hope that our study shows that it is possible to connect constraints from turn taking to macro-level patterns across languages, and then test the link using large corpora and custom methods. Anita will be presenting an experimental approach to this question at this year’s CogSci conference. We show that /w,h/ is a good predictor of questions in real English conversations, and that people actually use /w,h/ to help predict that a question is coming up. Slonimska, A., & Roberts, S. G. (2017). A case for systematic sound symbolism in pragmatics: Universals in wh-words. Journal of Pragmatics, 116, 1-20. Article. PDF. All data and scripts are available in this github repository. 2 PhD positions available with Bart de Boer in Brussels! Two PhD positions are available in the AI lab at the Vrije Universiteit Brussel with Bart de Boer. We are looking for a PhD student to work on modeling the emergence of sign languages, with a focus on modeling the social dynamics underlying existing signing communities. The project relies on specialist expertise of the Kata Kolok signing community that has emerged in a Balinese village over the course of several generations. The emergence of Kata Kolok, and the demographics of the village have been closely studied by geneticists, anthropologists, and linguists. A preliminary model has been built in Python, simulating this emergence. 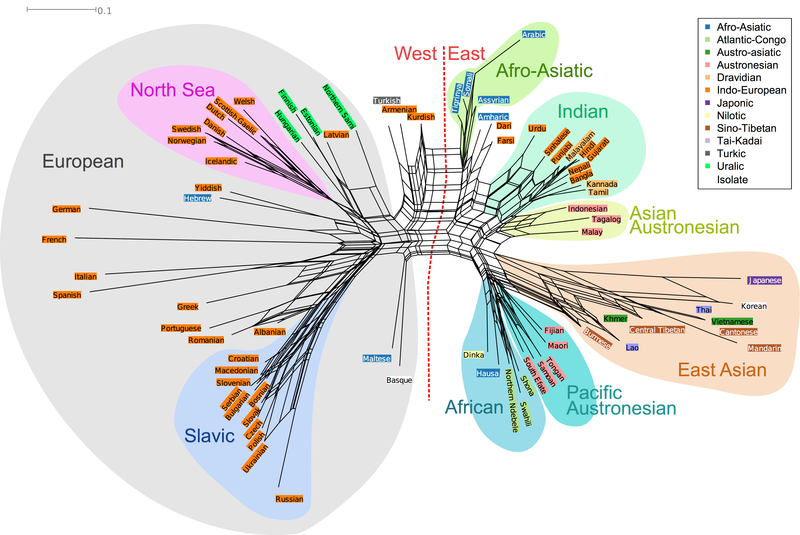 The aim of the project is to investigate, using a combination of linguistic field research and computational modeling which factors – cultural, genetic, linguistic and others – determine the way language emerges. There will be one PhD student in Nijmegen conducting primary field research on Kata Kolok and one based in Brussels (as advertised here) to be involved in the computational aspect of the project. Both positions are part of a FWO-NWO funded collaboration of the Artificial Intelligence lab of the Vrije Universiteit Brussel and the Center for Language Studies at Radboud University Nijmegen and the advertised position is supervised by profs. Bart de Boer and Connie de Vos. We are looking for someone who has (or who is about to complete) a master’s degree in artificial intelligence, speech technology, computer science or equivalent. You will work on a project that investigates advanced techniques for learning the building blocks of speech, with a focus on spectro-temporal features and dynamic Bayesian networks. It is part of the Artificial Intelligence lab of the Vrije Universiteit Brussel and is supervised by prof. Bart de Boer. The deadline for application is 1st July 2017. Other details available at the links above. Questions about details of the positions themselves should be directed to Bart de Boer (bart@arti.vub.ac.be). However, I myself did my PhD with Bart at the VUB, so I’d also be happy to answer more informal questions about working in the lab/living in Belgium/other things (hannah@ai.vub.ac.be). Author HannahPosted on 17 May, 2017 17 May, 2017 Categories UncategorizedLeave a comment on 2 PhD positions available with Bart de Boer in Brussels! A new paper by Monica Tamariz, myself, Isidro Martínez and Julio Santiago uses an iterated learning paradigm to investigate the emergence of iconicity in the lexicon. The languages were mappings between written forms and a set of shapes that varied in colour, outline and, importantly, how spiky or round they were. 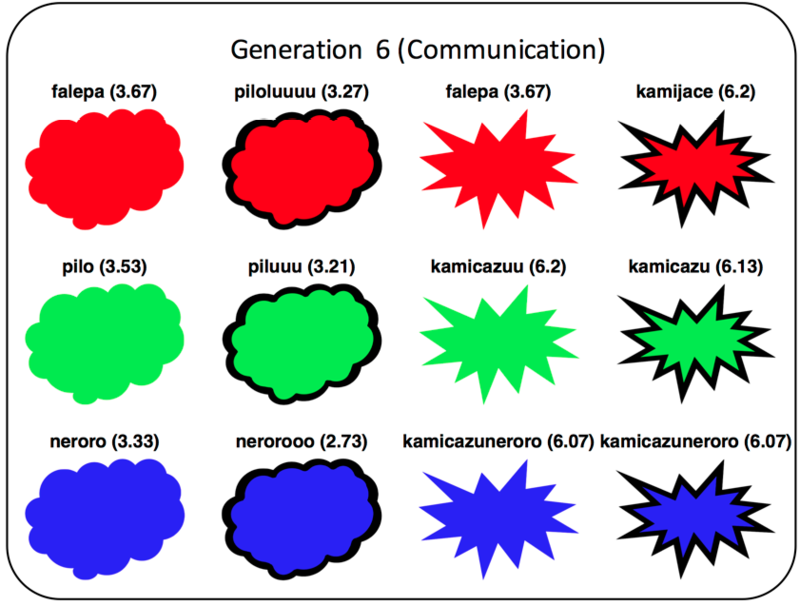 We found that languages which begin with no iconic mapping develop a bouba-kiki relationship when the languages are used for communication between two participants, but not when they are just learned and reproduced. The measure of the iconicity of the words came from naive raters. An example language from the final generation of our experiment: meanings, labels and spikiness ratings. These experiments were actually run way back in 2013, but as is often the case, the project lost momentum. Monica and I met last year to look at it again, and we did some new analyses. We worked out whether each new innovation that participants created increased or decreased iconicity. We found that new innovations are equally likely to result in higher or lower iconicity: mutation is random. However, in the communication condition, participants re-used more iconic forms: selection is biased. That fits with a number of other studies on iconicity, including Verhoef et al., 2015 (CogSci proceedings) and Blasi et al. (2017). Jones, M., Vinson, D., Clostre, N., Zhu, A. L., Santiago, J., Vigliocco, G. (forthcoming). The bouba effect: sound-shape iconicity in iterated and implicit learning. Proceedings of the 36th Annual Meeting of the Cognitive Science Society. Our paper is quite short, so I won’t spend any more time on it here, apart from one other cool thing: For the final set of labels in each generation we measured iconicity using scores from nieve raters, but for the analysis of innovations we had hundreds of extra forms. We used a random forest to predict iconicity ratings for the extra labels from unigrams and bigrams of the rated labels. It accounted for 89% of the variance in participant ratings on unseen data. This is a good improvement over some old techniques such as using the average iconicity of the individual letters in the label, since random forests allows the weighting of particular letters to be estimated from the data, and also allows for non-linear effects when two letters are combined. So the method was a bit overkill in this case, but might be useful for future studies. All data and code for doing the analyses and random forest prediction is available in the supporting information of the paper, or in this github repository. Back in March 2014, Hedvig Skirgård and I wrote a post about the Great Language Game. 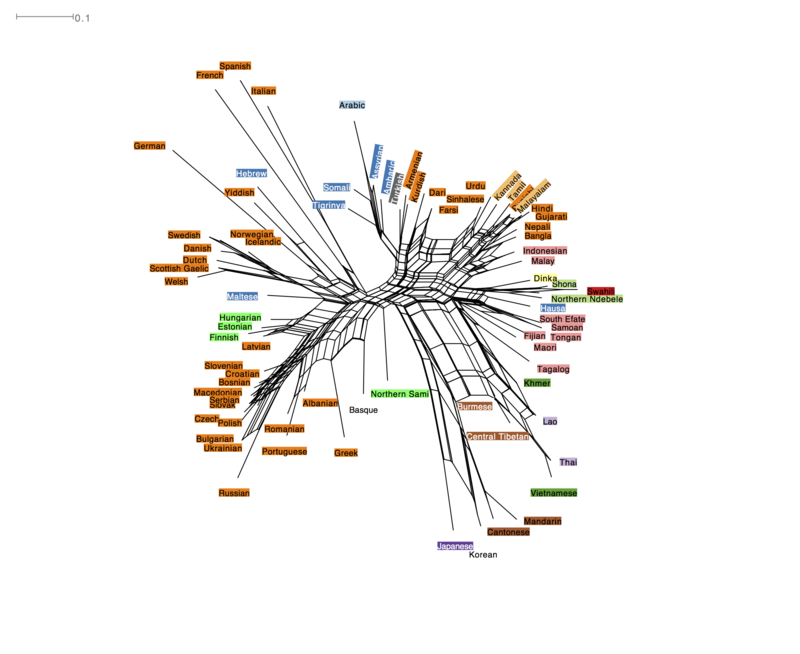 Today we’ve published those results in PLOS ONE, together with the Game’s creator Lars Yencken. One of the fundamental principles of linguistics is that speakers that are separated in time or space will start sound different, while speakers who interact with each other will start to sound similar. Historical linguists have traced the diversification of languages using objective linguistic measurements, but so far there has never been a widespread test of whether languages further away on a family tree or more physically distant from each other actually sound different to human listeners. We calculated the probability of confusing any of the 78 languages in the Great Language Game for any of the others (excluding guesses about a language if it was an official language of the country the player was in). Players were good at this game – on average getting 70% of guesses correct. We also used Random Forests analyses to show that a language is more likely to be guessed correctly if it is often mentioned in literature, is the main language of an economically powerful country, is spoken by many people or is spoken in many countries. This diagram shows a kind of subway map for the way languages sound. The shortest route between two languages indicates how often they are confused for one another – so Swedish and Norwegian sound similar, but Italian and Japanese sound very different. 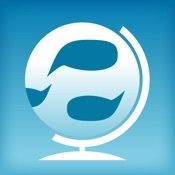 The further you have to travel, the more different two languages sound. So French and German are far away from many languages, since these were the best-guessed in the corpus. 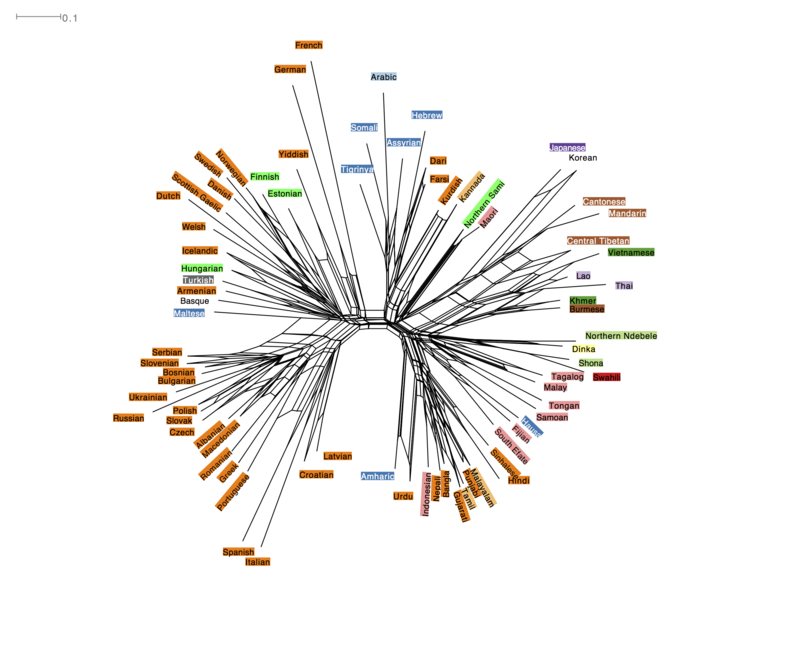 The labels we’ve given to some of the clusters are descriptive, rather than being official terms that linguists use. The first striking pattern is that some languages are more closely connected than others, for example the Slavic languages are all grouped together, indicating that people have a hard time distinguishing between them. Some of the other groups are more based on geographic area, such as the ‘Dravidian’ or ‘African’ cluster. The ‘North Sea’ cluster is interesting: it includes Welsh, Scottish Gaelic, Dutch, Danish, Swedish, Norwegian and Icelandic. These diverged from each other a long time ago in the Indo-European family tree, but have had more recent contact due to trade and invasion across the North Sea. The whole graph splits between ‘Western’ and ‘Eastern’ languages (we refer to the political/cultural divide rather than any linguistic classification). This probably reflects the fact that most players were Western, or at least could probably read the English website. That would certainly explain the linguistically confused “East Asian” cluster. There are also a lot of interconnected lines, which indicates that some languages are confused for multiple groups, for example Turkish is placed halfway between “West” and “East” languages. It was also possible to create neighbour nets for responses from specific parts of the world. While the general pattern is similar, there are also some interesting differences. For example, respondents from North America were quite likely to confused Yiddish and Hebrew. They come from different language families, but are spoken by a mainly Jewish population and this may form part of players’ cultural knowledge of these languages. In contrast, players from African placed Hebrew with the other Afro-Asiatic languages. Results like this suggest that perception may be shaped by our linguistic history and cultural knowledge. 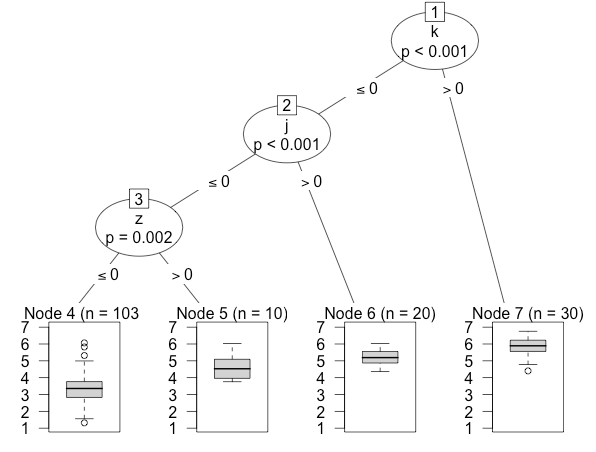 We also did some preliminary analyses on the phoneme inventories of languages, using a binary decision tree to explore which sounds made a language distinctive. Binary decision trees identified some rare and salient features as critical cues to distinctiveness. The analyses were complicated because we knew little about the individuals playing beyond the country of their IP address. However, Hedvig and I, together with a team from the Language in Interaction consortium (Mark Dingemanse, Pashiera Barkhuysen and Peter Withers) create a version of the game called LingQuest that does collect people’s linguistic background. It also asks participants to compare sound files directly, rather than use written labels. You can download LingQuest as an apple App, or play it online here. The University of Lyon 2 is proud to announce ‘Triggers of Language Change in the Language Sciences’. October 11th-14th 2017, University of Lyon, France. See the website for our call for papers and further details. The conference is part of the “X in the Language Sciences” (XLanS) series which aims to bring a wide range of researchers together to focus on a particular topic in language that interests them. The goal is to identify the crucial issues and connect them with cutting-edge techniques in order to develop better explanations of linguistic phenomena (see details of the first conference “Causality in the language sciences” here). This year’s topic is ‘triggers of change’: What causes a sound system or lexicon or grammatical system to change? How can we explain rapid changes followed by periods of stability? Can we predict the direction and rate of change according to external influences? We are pleased to be able to offer scholarships to cover travel for students from the developing world and reduced rates for lower-income attendees. See the Registration Details page for details. Human weaning times are extraordinarily long. Human infants spend their first few months being highly dependent on their caregivers, not just for food but for pretty much any interaction with the environment. Even by the time they are walking they still spend years being dependant on their caregivers. Hence, it would be a good for their parents to stick around and care for them – instead of catapulting them over the nearest mountain. Piantadosi and Kidd argue that “[h]umans must be born unusually early to accommodate larger brains, but this gives rise to particularly helpless neonates. Caring for these children, in turn, requires more intelligence—thus even larger brains.” [p. 1] This creates a runaway feedback loop between intelligence and weaning times, similar to those observed in sexual selection. Piantadosi and Kidd’s computational model takes into account infant mortality as a function of intelligence and head circumference, but also take into account the ooffspring’s likelihood to survive into adulthood, depending on parental care/intelligence. The predictions are based on the population level, and the model predicts a fitness landscape where two optima emerge: populations either drift towards long development and smaller head circumference (a proxy for intelligence in the model) or they drift towards the second optimum – larger heads but shorter weaning time. Once a certain threshold has been crossed, a feedback loop emerges and more intelligent adults are able to support less mature babies. However, more intelligent adults will have even bigger heads when they are born – and thus need to be born even more premature in order to avoid complications at birth. To test their model’s predictions, the authors also correlated weaning times and intelligence measures within primates and found a high correlation within the primate species. For example, bonobos and chimpanzees have an average weaning time of approximately 1100 days, and score highly in standardised intelligence measures. Lemurs on the other hand only spend 100 days with their offspring, and score much lower in intelligence. Furthermore, Piantadosi and Kidd also look at the relationship between weaning age with various other physical measures of the body, such as the size of the neocortex, brain volume and body mass. However, weaning time remains the most reliable predictor in the model. 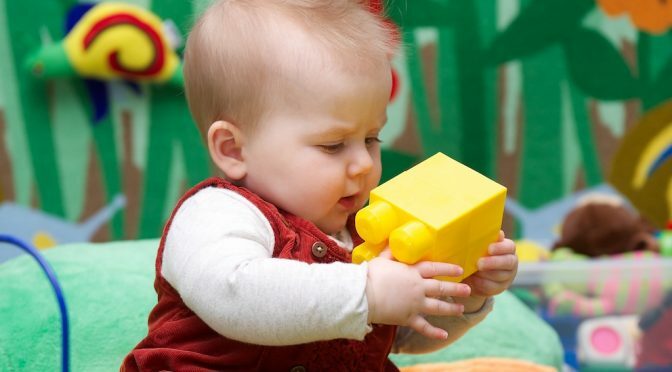 Piantadosi and Kidd’s model provides a very interesting perspective on how human intelligence could have been the product of a feedback loop between developmental maturity and neonatal head size, and infant care. Such a feedback component could explain the considerable evolutionary change humans have undergone. Yet between the two optima of long birth age and a small brain radius and a short birth age and a large brain, most populations do drift towards the longer birth/smaller brain (See graph 2.A in the paper). It appears that the model cannot explain the original evolutionary pressure for more intelligence that pushed humans over the edge: If early humans encountered an increased number of early births, why did those populations with early births not simply die out, instead of taking the relatively costly route of becoming more intelligent? Only once there is a pressure towards more intelligence, it is possible that humans were pushed into a location leading the self-enforcing cycle of low birth age and high parental intelligence, and this cycle drove humans towards much higher intelligence than they would have developed otherwise. Even if the account falls short of ultimate explanations (i.e. why a certain feature has evolved, the reason), Piantadosi and Kidd have described an interesting proximate explanation (i.e. how a feature evolved, the mechanism). Because the data is correlative in its nature only, the reverse hypothesis might also hold – humans might be more intelligent because they spend more time interacting with their caregivers. In fact, a considerable amount of their experiences is modulated by their caregivers, and their unique experience might also create a strong embodied perspective on the emergence of social signals. For example, infants in their early years see a proportionately high number of faces (Fausey et al., 2016). Maybe infants’ long period of dependence makes them learn so well from other people around them, thereby allowing for the acquisition of cultural information and a more in-depth understanding of the world around them. Therefore, the longer weaning time makes them pay much more attention to caregivers, providing a stimulus rich environment that human infants are immersed in for much longer than other species. Whatever the connection might be, I think that this kind of research offers a fascinating view on how children develop and what makes us human. Thanks to Denis for finding the article. There is no shortage of special issues on language evolution in the current landscape of academic journals. However, probably none of the three upcoming special issues I know of (or the many more I don’t know of) will match Tecumseh Fitch’s special issue on “Empirical approaches in the study of Language Evolution” in “Psychonomic Bulletin and Review”, at least in terms of sheer size – by my count, the issue contains no less than 36 contributions by 39 mostly very well-known researchers. The volume starts out with an impressive overview – which also serves as a review paper on recent advances in language evolution research – by Fitch himself. Like some of the other contributions, it is freely available with open access. As all contributions are available as “online first” papers at the moment and have not been assigned to an issue of the journal yet, the references section of the overview is also a good starting point for retrieving the other papers in the special issue. Some of the papers are response articles to other contributions in the volume, which nicely highlights some key debates and open questions in the field. For example, both David Adger and Dan Bowling react to Simon Kirby’s paper on “Culture and biology in the emergence of linguistic structure”. Reviewing a large number of (both computational and behavioral) experiments using the Iterated Learning paradigm, including recent work on Bayesian Iterated Learning, Kirby argues that linguistic structure emerges as sets of behaviors (utterances) are transmitted through an informational bottleneck (the limited data available to the language learner) and the behaviors adapt to better pass through the bottleneck. According to Kirby, “[a]n overarching universal arising from this cultural process is that compressible sets of behaviours pass through the bottleneck more easily. If behaviours also need to be expressive then rich systematic structure appears to be the inevitable result.” Adger, however, argues that expressivity and compressibility are not sufficient to explain the emergence of structure. He points out that the systematicity of human languages is restricted in particular ways and that in the case of some grammatical phenomena, the simplest and most expressive option is logically possible but unattested in the world’s languages. He therefore argues that the human language capacity imposes strong constraints on language development, while the structures of particular languages arise in the way envisaged by the Iterated Learning model. Kirby also discusses the relation between biological and cultural factors in language evolution. Probably the most far-reaching conclusion he draws from Iterated Learning models (in particular, from work by Bill Thompson et al.) is that the language faculty can only contain weak domain-specific constraints, while any hard constraints on the acquisition of language will almost certainly be domain-general. Bowling’s response is targeted at this aspect of Kirby’s theory. While being sympathetic with the emphasis on cultural evolution, he argues that it “fails to leave the nature-nurture dichotomy behind”, as constraints are identified as either cultural or biological. Unfortunately, Bowling doesn’t really have enough space to unfold this argument in more detail in this very short response paper. A second paper in the special issue that is accompanied by a short commentary is Mark Johnson‘s “Marr’s levels and the minimalist program” (preprint). He discusses the question “what kind of simplicity is likely to be most related to the plausibility of an evolutionary event introducing a change to a cognitive system?” Obviously, this question bears important implications for Chomsky’s minimalist theory of language evolution, according to which a single mutation gave rise to the operation Merge, “a simple formal operation that yields the kinds of hierarchical structures found in human languages”. Johnson points out that just because a cognitive system is easy to describe does not necessarily mean that it is evolutionarily plausible. In order to approach the question “What kind of simplicity?”, he takes up David Marr’s levels of analysis of cognitive systems: the implementational level (the “hardware”), the algorithmic level (the representations and data structures involved), and the computational level (the goal(s) of the system; the information it manipulates; the constraints it must satisfy). He suggests that complexity of genomic encoding might be most closely related to complexity at the implementational level. The introduction of Merge, however, is complex at the computational level, while the changes on the other two levels could be quite complex. To strengthen the minimalist account of language evolution, then, one would have to either show systematic connections between the three levels, or demonstrate that a simple change to neural architecture can give rise to human language. Kirby’s and Johnson’s papers and the respective responses can of course only give a glimpse of the thematic breadth of the special issue and the diversity of theoretical frameworks represented in the volume. Other topics include, e.g., the architecture of the “language-ready brain”, advances and missed opportunities in comparative research, and the role of different modalities in the evolution of language.